Hello, my friends. It’s been a fair old while since I wrote, and I’m sorry for that! … As well as this, the game has been selected to be exhibited in Fantastic Arcade, and I’ll be in Austin, Texas this month from the 19th-26th to meet some of my US / Canadian brethren, eat BBQ, and generally enjoy the Southern hospitality! If you’re going, let me know and we can meet up! The show itself runs from the 20th-23rd. I’ve also been getting the art cards finalised. It’s taken quite a few print runs to get them right (including throwing away a whole batch which got cropped wrong.) Anyway, they arrived with me the day before I came on holiday (where I now am, in Spain.) I plan to get these out as soon as I return, and I’ll be sending a final email to all the supporters when I do, in case of any final address changes. Besides that I’ve had to do a lot of business stuff, setting up Superflat Games as a Ltd. company etc, stuff I don’t really understand, which scares me a lot, but of course I have to do. I’ve also been doing a fair bit of music. I’ve put some love back into my studio space and made it a much more pleasant place to work. I made a couple of tunes for my good friend and idol, Jonatan ‘cactus’ Söderström, for his new game, Hotline Miami (also selected for Fantastic Arcade, so hopefully we finally get to meet), which seems to be blowing up right now, and I can tell you guys, from watching it develop, that it lives up to the hype in every way! Been doing some 140bpm tunes under the North Base moniker too (which mainly consists of four other friends from Manchester, one of whom, Silver, was my drum’n’bass partner for about ten years) … some of which have been signed, others still in the works. Really enjoying making music for the sake of making music again. 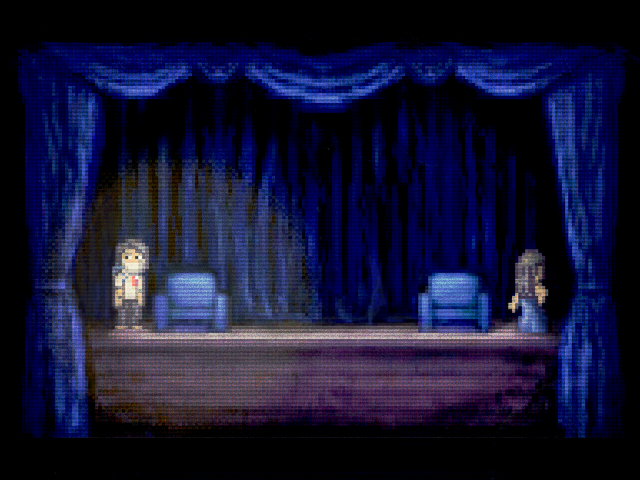 And then there’s the games which aren’t LONE SURVIVOR. Well, I’ve started about four different games now (none of which have names yet besides XO3D), and all are currently on hold while I work out what it is I really want to spend the next few years doing. 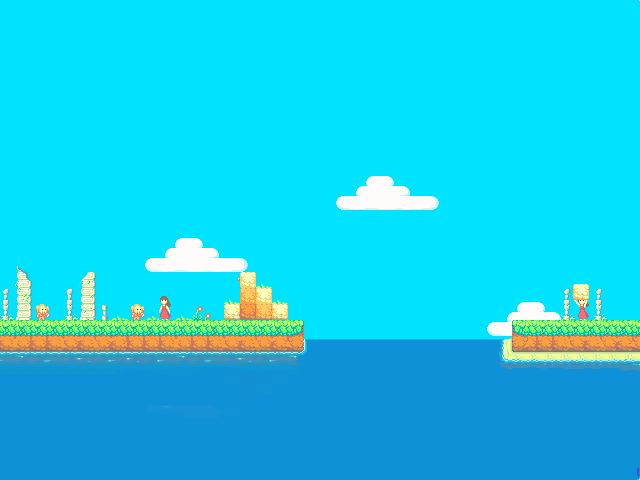 I just don’t see myself making shorter games, they always end up large in scope somehow. So I want to be absolutely sure I’m making something I’m still going to enjoy in a couple of years! 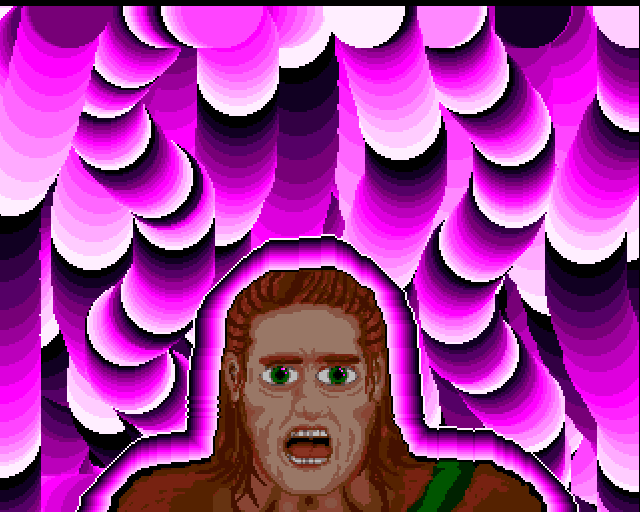 I may choose to enter LS into IGF again this year, I guess I figure that it was only half finished last year, or at least the beginning was not in a good shape, so now it is final, I figured I’d give it one more shot? Anyway, that about brings it up to date. Thanks once again for your support, and all the kind messages you’ve sent. I really never expected it to reach so many people, and as I’m sure I’ve said before, I’m awed and humbled. I’ll be mailing out the art cards soon… but there is one final decision to be made. It’s a toss-up between the photo print or the postcard print, so I’m really calling for all you First Aid owners to suggest what you’d like! Either way, I’m going to submit it for printing next week, so if you have a strong opinion, chime in now! I personally feel, even though I haven’t seen the postcard sample, that the lower dpi won’t matter that much, I’m assured the colour balance should be identical, though. So, would you rather a super sharp but photo-like print, or a physical postcard, sturdy but less detailed? Answers on a … er … comment down below! Have you moved house recently, First Aid Edition owner? … making sure to use the subject line “First Aid Move” or something pretty obvious so I can tell it’s not an update request etc, including your new address. Thankyou all for supporting the game when it first launched, it’s been an unbelievable few months since then! 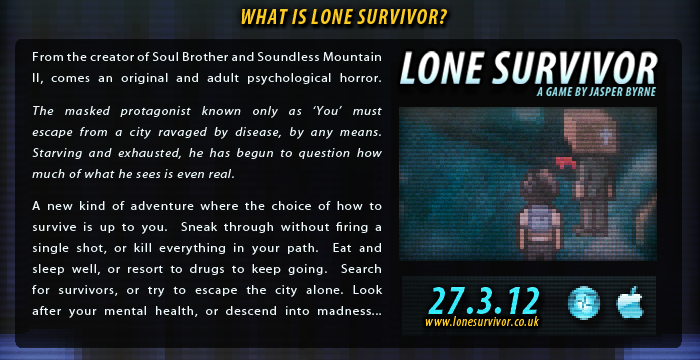 Thanks also to those who’ve recently got it through the Steam and HIB sales, and welcome to the world of LONE SURVIVOR. I’ve been working on this for a while, but just recently decided to abandon it, for no other reason other than it didn’t get me super excited. I may return to it and add what I planned to, and it may become something exciting because of that, just not right now. So I started working on this – although it’s nothing more than a few bits of art and some vague ideas at present. For some reason, and maybe it’s just the the UK summer finally decided to show its face, a couple of months late, that I really want to explore some nostalgic Blue Sky™ right now! 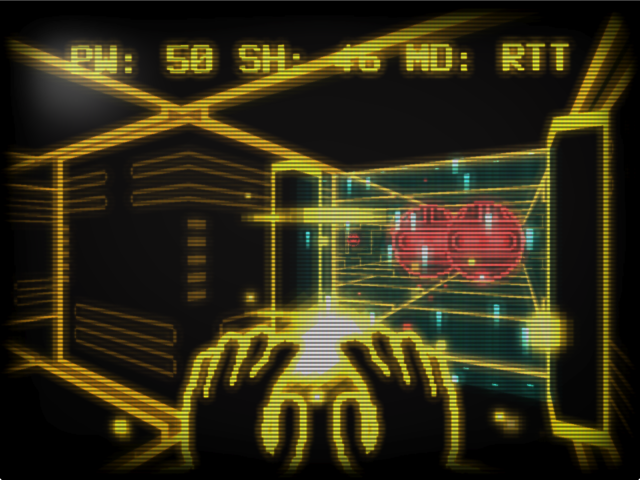 I’ve been working on my new thing, a shooter which spilled over from 7dfps. I’ve just got the engine done and I’m pretty excited about it! Please bear in mind that they are coming in much slower now, but I’m still doing them in batches of ten or twenty to keep things methodical. This means your update can slip for a few days sometimes, depending on how many come in around that time – but it will come through eventually! As I’ve done thousands of these by hand, some have slipped through the net and I apologise for that, please just send your Fastspring order code starting with SUP-xxxx through and I’ll reply with your update key in the next batch. It’s with great pleasure, exhaustion, joy and relief that I announce the end to this four year chapter of my life. It’s done. It’s finished. It’s complete. It’s available to buy. It has every drop of my heart and soul in it. But most importantly it’s here. Thanks for supporting me along the way, and I hope you enjoy the game! 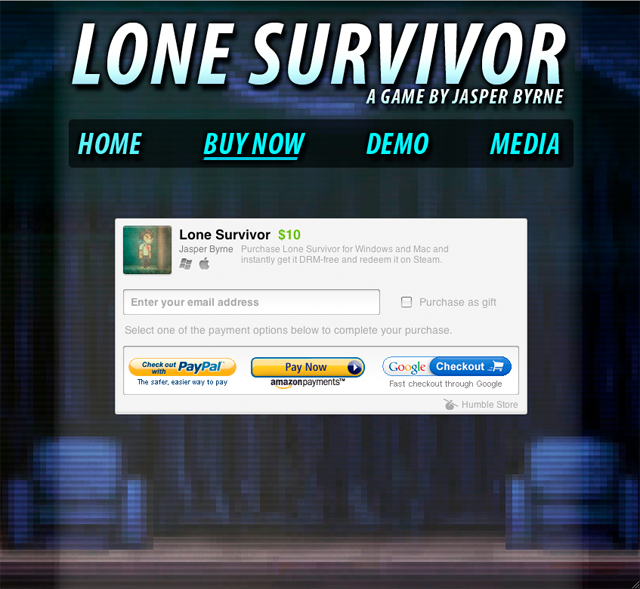 Or visit www.lonesurvivor.co.uk to purchase the game. Just a very quick post to say all’s going well for launch. 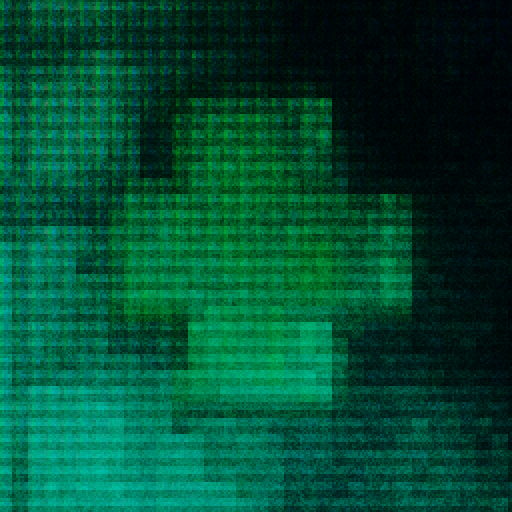 The video’s done (but not live yet), www.lonesurvivor.co.uk is done and now live, as the title of this post suggests. You’ll be able to buy the game there next Tuesday. The enormous mountain of press and promotion emails is getting smaller slowly. I just re-submitted to Steam. 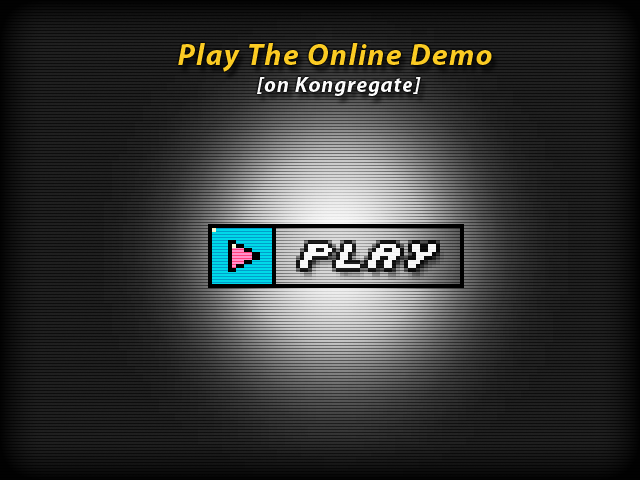 I’m going to start the demo later on, or tomorrow. I hope I can get it done on time! Sort of flying at the moment, I don’t know if it’s excitement or delirium. I’m glad to mostly done with the promotional material though, it’s not the part of the job I enjoy the most!